The Zapatistas, in their Feb. 14 communication, “The Walls Above, The Cracks Below (and To The Left)” (http://enlacezapatista.ezln.org.mx/2017/02/16/the-walls-above-the-cracks-below-and-to-the-left/), asked their supporters to organize themselves “according to [their] times, ways, and geographies, to support activities for and by those who are resisting and rebelling against expulsions.” That is, support for migrants, especially those in the U.S. Thus, the support that the Zapatistas are giving to the migrants is not just a practical or a moral one, but one full of revolutionary meaning. Why? 1) In order to produce 7,000 pounds of coffee, the Zapatistas had to work collectively, therefore reinforcing their own organizational process. 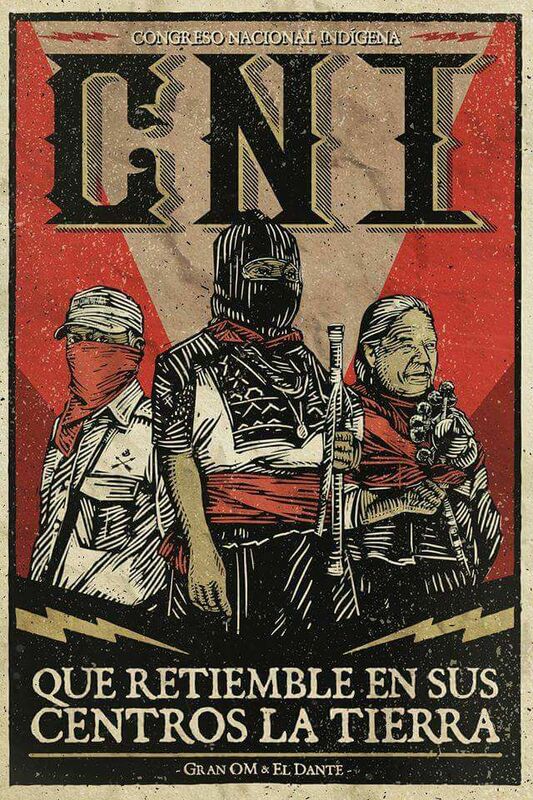 Subcomandante Insurgente Moisés, from the Zapatista Army for National Liberation (EZLN), gives us a detailed description of this in the previously quoted communication. 2) With this economical support, the migrants will be more capable of going through the adverse conditions they face in the U.S., thus becoming actual subjects of resistance against Donald Trump’s racist policies. 3) Furthermore, the Zapatistas are encouraging the migrants to get organized, not just in order to receive the coffee or the money, but to “resist and rebel,” to keep on fighting for a world in which “every human being has the right to a free and dignified existence in the place that they deem best” (http://enlacezapatista.ezln.org.mx/2017/02/16/the-walls-above-the-cracks-below-and-to-the-left/). The proposal by the National Indigenous Congress—of which the Zapatistas are a substantial part—about taking part in the 2018 election process (see Jan.-Feb. 2017 N&L, Letter from Mexico “Indigenous organize to contest 2018 vote“) is important precisely because it will allow the social subjects nationwide to get to know the “Zapatista methodology,” a method that seeks to unite practice and theory, voices from below and critical thought—and which, developed at its fullest, could mean a whole new beginning of revolution in Mexico and the world. This entry was posted in Articles and tagged Chiapas, CNI, Donald Trump, EZLN, immigrants, J.G.F. Héctor, migrants, National Indigenous Congress, subcomandante insurgente Moisés, The Walls Above The Cracks Below (and To The Left), Zapatista, Zapatista Army for National Liberation. Bookmark the permalink.